Looking for a Cherry Wood Desk and Credenza in Pittsburgh? Learn how to find the right Executive Desk Set for you. Looking to get an executive desk set for your office? We have the knowledge you are looking for to make sure that your purchase is exactly what you need. The primary factors you will be considering here are the size of the unit, what available storage it has, and the general shape and design of the desk. Your hope is to select a desk that strikes a balance between function and form, and we’re here to help you out, whether it’s a Cherry Wood Desk and Credenza in Pittsburgh, or something else. Yet another important decision point in your desk, storage it paramount to you being able to operate at peak efficiency in your own office. The various forms storage usually comes is are as follows: hutches, credenzas, and free-standing bookcases. If for whatever reason, the desk doesn’t come with any of these, be sure to inquire as to whether you can purchase matching storage appendages. Size is most likely the most important criteria to look at when you’re looking to buy. You need to know how it fits in relation to the space you’re putting it in. It’s considered standard office etiquette to include at least two guest chairs in your office. You also want to make sure that you are considering the style of desk you need to purchase. An L-shaped executive desk set leaves more room, but if you have ample space a U-shaped executive desk would most likely be the best idea, because it has a bit more space and versatility. One of the most important aspects to owning an executive desk is that you want something that looks appealing… a wooden place to make your den. There are a number of different options, ranking from maple, cherry, mahogany, walnut, and various other kinds of laminates and finishes. 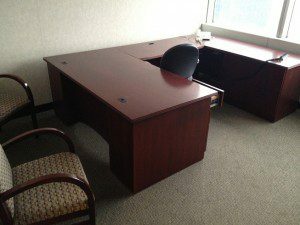 At Integrity Wholesale Furniture, we Pride ourselves on carrying a wide variety of different used executive desk sets, so we’re sure to have something for you. Regardless of your preference, there’s something here for you. Please feel more than welcome to get ahold of us and inquire about our Cherry Wood Desk and Credenza in Pittsburgh, or anything else you might be looking for. No Comments on "Looking for a Cherry Wood Desk and Credenza in Pittsburgh? Learn how to find the right Executive Desk Set for you."